Experienced Intelligence Operative with a demonstrated history of working in the area of Activism involving the Financial Markets and Financial Forensics. Skilled in OSINT, Analytical Skills, Strategic Planning, International Relations, and Networking. Strong Internet Warrior working towards Honest Money and Freedom which evolved into working as a civilian in Military Grade Intelligence Operations involving the Collateral Accounts and Global Monetary Transformation. Acted as Counterintelligence Officer to targeted Barclays banker, Edmund JM Dunne for 16 months until he was rescued from tortuous living conditions and isolation in the countryside of Ireland on January 11, 2018. My intelligence gathering began as an Activist at the OWS camp on the New Haven Green, New Haven CT in 2011 during Occupy Wall Street. I work internationally with many other individuals and groups towards advancements in the Rule of Law globally. We monitor geopolitics, capital markets, currencies, global monetary transitions, cryptocurrency, and blockchain for the purposes of International Security. Our mission is to secure Permanent Peace and Prosperity for future generations by advocating for sound money. We organize efforts in Diplomacy, Education, Broadcast, and Peacekeeping. We report regularly to International Law Enforcement in seven jurisdictions. My reports are made public and sent to the U.S. Naval Criminal Investigative Service. Our work is open to all nations, agencies, and brotherhoods equally. Out of the darkness, always comes the light. Emblem of the British Special Air Forces (SAS). Dame Sally Coleman Powell courageously flew from London to Ireland to come to Edmund’s rescue. Edmund had been living in tortuous isolation and extremely suicidal for over a year. I guarded his life hourly from USA for nine months via the Internet. There were ninety suspicious banker deaths surrounding the years of the LIBOR scandal both homicides and suicides; Edmund survived this. A German banker by the name of Wolfgang Struck, one of the possible signatories of the Global Debt Facility (Umbrella account code # TVM-LSM-666) goes on record regarding the world’s patrimony. “Any questions Anybody?” – W.S. “I thank you for your analysis Deimantas. I can assure you that we have a few good revolutionaries here in USA. There are thousands upon thousands of us who can see through the thickness of the night. We have found each other through the inner webs and then we met each other on the street. We formed quite a good resistance here only to have social media snuff us out with censorship and the adjustment of the algorithms. For once, we know our true opposition, and we have realized that our destinies are tied together. We are quiet now, but we are still here. We have exchanged phone numbers, a highly revolutionary act in the age of the Internet. We work stealthy, behind the scenes for you. We are behind a most revolutionary banner. A banner of; knowledge, healing, peace, and forgiveness. My former boss and best friend, Edmund JM Dunne is now healing and in a new location. Edmund is a Barclays investment banker that survived the long string of suspicious banker deaths surrounding the LIBOR scandal. Edmund was found trapped in tortuous isolation and living conditions, in the countryside of Ireland, on the estate of aristocracy suffering severely from trauma. For years he had written to law enforcement, governments, officials and embassies for assistance, only to be ignored or dismissed. As an American activist, I discovered Edmund missing and found him extremely and publicly suicidal on his Facebook page (currently taken offline by himself) after World Bank Whistleblower, Karen Hudes published his private e-mails. I rallied the Anonymous collective and the cryptocurrency enthusiasts to help me amplify Edmund’s voice on social media and to coordinate relief efforts for him. He was assisted by civilians all over the world and two attorneys from the UK, who working collectively, along with Edmund’s father, to relocate Edmund to his hometown community where he now has the support of a thriving small town. Edmund still has some difficult days but he is not longer suicidal on a daily basis and he is painting! “The time is always right to do what is right.” – Dr. Martin Luther King Jr.
Helen Edwards, victim of Money Laundering and Death Threats in Australia leads her country in advancements towards the Rule of Law. “CYBER CRIME” POTENTIAL GLOBAL CLASS ACTION – UNLAWFUL BEHAVIOUR – Australia to date 4,186 claims to Western Union U.S. Department of Justice in relation to the $586m Remission – NOT ACCEPTABLE THAT REFUNDS NOT PAID AS YET! Western Union have a $586m remission and have been charged on 2 counts for failure to their customers? “Western Union owes a responsibility to American consumers to guard against fraud, but instead the company looked the other way, and its system facilitated scammers and rip-offs,” said FTC Chairwoman Edith Ramirez. MONEY LAUNDERING AND CYBER CRIME; A RISK TO INTERNATIONAL SECURITY. Do we push harder for a Global Currency Reset or do we let the clowns flounder around a bit more? “I saw securities fraud. I saw information that was not being disclosed to $180 billion dollars worth of bond holders. It was my job to make sure that the financial statements were correct. So I went up the corporate ladder. I first went to the audit committee. When that didn’t work, I went to the US Treasury, and when that didn’t work, I went the the US Congress. Senator Lugar wrote three letters to the World Bank telling them not to fire me. I was fired anyhow. Three senators asked for a GAO inquiry. The money was going any which way… $900 million dollars worth of money meant to fight poverty in the Philippines went to a corrupt man, Lucio Tan who was default on his loans. The Philippine National Bank went into default…” – K. H.
Is Karen Hudes for real? HUDES v. AETNA LIFE INS. CO.
JAMES E. BOASBERG, District Judge. David Dees is a former Sesame Street illustrator turned conspiracy theorist, political cartoonist, and purveyor of utter madness. His work is essentially an anti-Semitic version of John Scudamore after six too many Photoshop filters. David Dees believes in all the conspiracies. No, seriously. All of them. His cartoons have featured every possible conspiracy theory, and in every possible combination. You want a picture of Obama wearing a crown of thorns and smiling weirdly as he emerges from an egg labeled “Fascist World Government” perched atop a pile of gold coins, while a herd of sheep in the background hold up signs reading “O Baaa Ma!”? “When Dominique Strauss-Kahn, then Managing Director of the International Monetary Fund, asked about the gold in the Global Debt Facility allocated to the citizens of the world, he was run out of town. The United States remains a scofflaw and a deadbeat, failing to meet its shareholder commitment on the World Bank’s capital increase. This is because Jacob J. Lew, Secretary of the Treasury, forgot to tell US Congressional Appropriations Committees.” – K.H. Does USA still have the gold? “Good Question. Where is the gold? When was the last time we had a physical audit? The gold that Dominique was referring to is the hidden ancient gold, supposedly hidden from us since the beginning of civilization and includes the WWII loot. According to Karen’s interpretation, the Bretton Woods was created by Ferdinand Marcos to bring this gold out of hiding in 2005. This gold is supposed to be in banks all over the world and most of it buried in the Philippines. A German banker by the name of Wolfgang Struck went on record saying that some of the gold is under a swimming pool in the Philippines and that some of it is buried in caves, also in the Philippines, with CCTV camera that is signaled to an office at JP Morgan. My former boss, Edmund JM Dunne who has worked for; Rothschilds, Goldman Sachs and Barlclays also went on record that this gold exists. “The Banking Cartel’s plans…for a power shift to China in 2039, are not going to materialize. Why not? Because we are following the National War College’s power transition model. US leadership will continue until the end of this century, with the US minus the Federal Reserve Bank. The traitors in the Joint Chiefs of Staff and other agents of the Banking Cartel in the illegitimate US government have been exposed. The US and rest of the world’s military powers are following the power transition model. The world’s monetary gold resources in the Global Debt Facility are mobilized against the Banking Cartel, which is bankrupt and is being wound down.” – K.H. WORLD BANK WHISTLEBLOWER, KAREN HUDES FILES COMMERCIAL LIENS ON; JIM YONG KIM, CHRISTINE LAGARDE AND SEVERAL OTHERS USING COMMON LAW. 2(a) of the IBRD’s Articles of Agreement, which provides: “All the powers of the Bank shall be vested in the Board of Governors,” and Article V, Section 5 which requires those officials to respect the international character of my duty, and obligates them to refrain from all attempts to influence me in the discharge of my duties.” – K.H. “Donald J. Trump has failed to acknowledge that the United States is not operating under the Constitution of 1789 nor has he acknowledged that the US’ monetary gold reserves are administered by the Board of Governors of the World Bank and International Monetary Fund because they are in a Trust established at the end of WWII by General Eisenhower and President Truman. Instead, Donald Trump has perpetuated the hoax on the American people, despite having had the opportunity to rectify these falsehoods https://s3.amazonaws.com/khudes/trump1.pdf. 22. Donald Trump, and Mike Pence, who are neither the legitimate President nor Vice- President of the United States, due to the electoral college not having been duly convened, (since the Constitution of 1789 is not in effect), Barack Obama, acting outside his office as then-purported President of the US, Joe Biden, acting outside his office as then purported Vice-President of the US, Martin Dempsey, acting outside his office as then Chairman of the Joint Chiefs of Staff, John McHugh, acting outside his office as then Secretary of the Army, Jacob Lew, acting outside his office as then-Secretary of the Treasury, together with others at the Treasury Department, interfered with the return of the US’ monetary gold reserves held by TVM-LSM-666 in the Global Currency Reset. 24. J. Thomas Manger, Cathy Lanier, Melvin Gresham and Peter Newsham acted outside their respective duties as Chief of Police of Montgomery County, President of the Major Cities Chiefs of Police Association, then Chief of Police of the District of Columbia and then Commander of the District of Columbia Second Precinct by preventing my attendance of the BoardofGovernors’AnnualandSpringMeetings,myreturnto workattheIBRD’s headquarters in Washington DC, damaging my reputation through illegal surveillance, assessments and evictions, and other interference with my civil rights, including my illegal arrest and detainment on November 23 and 24, 2016. Jesse White acted outside his duties as Secretary of State of the State of Illinois by disregarding the letter dated April 19, 2015, that was cleared by each member of the Board of Governors of the IBRD and IMF, informing him that he did not possess the authority to invalidate a valid UCC-1 lien of TVM-LSM-666 on the insolvent Federal Reserve Bank of Chicago. T. Rymer, acting outside his office as then Inspector General of the Department of Defense, refused to carry out an investigation into unauthorized transports of gold belonging to TVM-LSM-666. 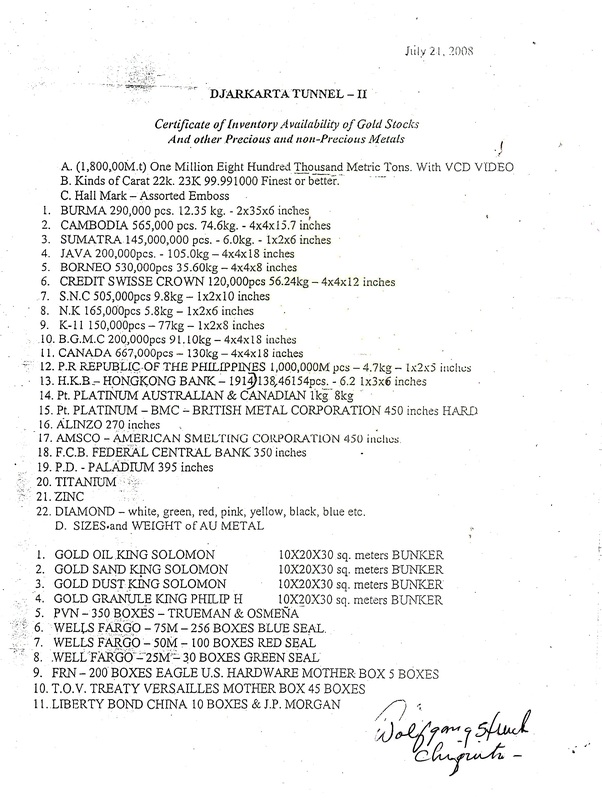 All of the above private individuals by their nonfeasance, misfeasance, and malfeasance, interfered with my fiduciary duties as Acting General Counsel of the IBRD and Legal Counsel to TVM-LSM-666 and prevented me from returning the world’s monetary gold reserves to the world’s people, pursuant to the decision of the Board of Governors of the World Bank and IMF to carry out the Global Currency Reset as described in https://s3.amazonaws.com/khudes/Twitter4.25.15.1.pdf ” – K.H. Not long ago, Geophysical Service Inc. (GSI) made a good living as Canada’s top owner of marine seismic data, employed 250 people and operated two ships that by creating sound waves produced images of the earth deep below the ocean floor. Its work helped oil companies discover some of Canada’s largest offshore oil fields, from Hibernia in the Grand Banks to Amauligak in the Beaufort Sea. Today, its business has dried up, its workforce can fit in a car, its assets have been liquidated to pay off debt, and the Calgary-based company is fighting two-dozen lawsuits claiming more than $2-billion in damages against federal and provincial governments, regulatory agencies, and some of Canada’s top oil companies. Geophysical Service Incorporated is fighting the expropriation without compensation, and abuse of its intellectual property, by government, and government agencies. This fight is costing GSI tens of millions of dollars in lost revenues, not to mention the costs of legal action to protect and recover its property. The intellectual property is the seismic data GSI has collected offshore Canada, for decades. •	As a brief background in offshore areas, The National Energy Board, Canada Newfoundland Offshore Petroleum Board and the Canada Nova Scotia Offshore Petroleum Board require mandatory submission of non-exclusive or speculative seismic survey results as a condition of obtaining permits to do the work. It may be legitimate that the Boards need this data in order to have current information for approval of work programs and for proper evaluation and management of resources. The boards created a time frame to keep the data confidential for a period of ten years, although GSI questions the right to set any time frame to ever disclose this information. •	After government created periods of confidentiality run out the seismic data is available to be shown or “viewed” by those in the industry interested in exploration. The boards told industry they would only act as a library. GSI in fact discovered that in some cases its data was being copied and in worse cases scenarios the data was reproduced for sale to third parties. •	Further to this in 2010 then Newfoundland and Labrador Minister of Natural Resources Kathy Dunderdale made the announcement that the province was changing the way speculative or non-exclusive seismic data was being released after a 10 year confidentiality period. The plan was to move from paper files to digital ones. This was termed modernizing to “keep up with technology” but it simply expanded the release of the very data that GSI licenses to customers. •	The boards are now using the data to promote the offshore by giving it away for free and reaping the benefits in the form of increased royalties on oil and gas production, taxes and local employment. Helen Edwards – leading Rule of Law advancements in Australia. Ignorance and negligence of national leadership regarding Money Laundering/ Cyber Crime has now escalated to Human Rights abuse and a risk to International security. Who is watching our monetary borders!? – Public safety at risk!! Australia we have a serious National Security Problem, in which I have had to seek International help. We have a MAJOR CONFLICT OF INTEREST with our recently exposed Financial Institutions at our recent Royal Commission who are funding our incompetent politicians. “…this needs to be in capital letters. QUITE REVEALING ABOUT THE LEGAL PROFESSION/ FRATERNITY/ FIRMS. This is often overlooked when discussing the other various roles; law enforcement, representatives, regulators etc. Helen has gone everywhere and to everyone and now knocking on the doors of the White House in USA for assistance. Lawyers should realize that they are playing a part in contributing to national security risks and destruction of their own country by their choices of representation. Where are the intelligent that recognizes the risk in Australia? Where are the public servants to investigate? Where are the regulators when control lapses occur? Where are the human rights defenders? John F. Kennedy Speech on a Free and Open Society – …a crime for any citizen to shrink form controversy. “Without debate, without criticism, no Administration and no country can succeed–and no republic can survive. That is why the Athenian lawmaker Solon decreed it a crime for any citizen to shrink from controversy. And that is why our press was protected by the First Amendment– the only business in America specifically protected by the Constitution- -not primarily to amuse and entertain, not to emphasize the trivial and the sentimental, not to simply “give the public what it wants”–but to inform, to arouse, to reflect, to state our dangers and our opportunities, to indicate our crises and our choices, to lead, mold, educate and sometimes even anger public opinion. Edmund experienced a deep sorrow and remorse for what his industry had done to the global economy that caused the crash of 2008, hardship and suffering for mankind, thousands of deaths, and also because of what he knew from working on the Vatican accounts, IOR and APSA. A good deal of Edmund’s time was spent thinking about reform, healing, and restitution. I believe he wanted to put a call out to all; government officials, bankers, law enforcement and global intelligence that it is time to get on the right side of history and he was willing to examine himself and be the first to step forward. “I’m looking at the Man In the Mirror”. Edmund always referred to JFK as “Bigs”. The lodge where Edmund was trapped in Ireland was only a 30 minute drive to the homestead of JFK’s grandfather. Yellow Vests/ GiletsJuanes are making an impact. This is my first e-mail to Commander Melvin Gresham of D.C. Police in Washington regarding the hidden gold that was put into a trust for humanity, referred to as the Global Debt Facility. Also referred to as the Collateral Accounts or the Heritage Accounts. Umbrella Account Code # TVM-LSM-666. After World Bank Whistleblower Karen Hudes was reinstated by the Board of Governors of the World Bank and IMF, her security badge was deactivated the next day. At a later date when Karen tried to attend a meeting at the World Bank, she was arrested. Karen claims that the World Bank is out of compliance and Karen proceeded to file commercial liens against both Chief Peter Newsham and Commander Melvin Gresham of D.C. Police on behalf of the Global Debt Facility. We are continuing to monitor this story. The Ministries of Foreign Affairs of member countries are blind copied. If you have any objections, please make that known at this time. “Following my testimony, Mr. Spagnoletti suggested that I should submit a formal complaint to BEGA about Commander Melvin Gresham, whose officers removed me illegally from the World Bank headquarters during the Spring meetings on April 17, 2015. This was following my repeated complaints to BEGA about Commander Gresham’s predecessor, Commander Michael Reese. The Global Debt Facility is not subject to the jurisdiction of the courts; my complaint of corruption is certainly not going to be subject to any adjudicatory process in BEGA. Indeed, my confidence in the rest of the District of Columbia’s government has also been shaken by a sad history of corruption.” – K.H.